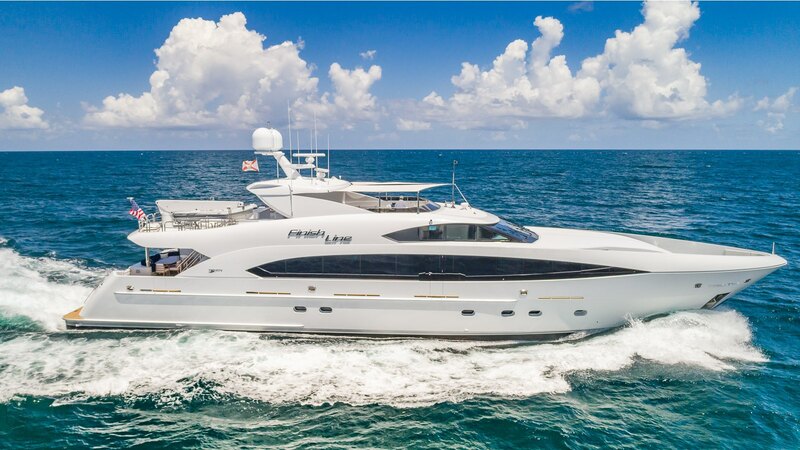 Finish Line is a yacht built with socializing in mind and a focus on relaxation and creating special family memories. Generous spaces, inside and out, abound throughout the yacht. Accommodations include the full beam master stateroom with three additional Queen staterooms completing the package. The port side stateroom features a queen bed that is easily converted into two twin beds if needed. The starboard guest stateroom is also a special versatile space that converts into a sitting room or play space, and even has storage for toys, making it the perfect option for families with younger children. Interior spaces include the main salon, with striking backlit marble bar, armchairs and L-shaped lounge seating, a formal dining space, and full entertainment system. Further forward is the North American style country kitchen galley, ideal for socializing with the chef and informal dining. The yacht’s private chef will create a bespoke menu to tantalize the taste buds for enjoyment throughout the charter. Award winning design and comfort will ensure all charter guests make the most of the Bahamas cruising grounds during their time on board.